When I was asked recently if I would like to join my colleague Charlie on a trip to Andalucía I jumped at the chance. I have spent quite a lot of time in the region but never in the area of the Sierras de Tejeda, Almijara y Alhama Natural Park, just 45 minutes from Malaga. I sighed when I first saw the flight time of 6am but soon realised that in order to fit a seven night holiday into just four nights we would need all the time we could get. On arrival in Malaga we were greeted by the smiling face of Sylvia, our taxi driver, who whisked us off to meet Sue and Gordon, our hosts for the coming days. The first destination on our whistle-stop tour was the Cuevas de Nerja (Caves of Nerja). These caves are a spectacular natural sight, formed from ancient cavities and adorned with stalagmites and stalactites. The largest of which is a stalagmite standing at 32 meters high and is the tallest in the world. After our visit to the caves we made our way out into the sun, reapplied the sun cream and headed off on our first walk. Starting our walk just meters from the entrance to the caves we headed up a gravel track, passing olive groves to reach the hidden entrance to the Barranco de Maro. Wild flowers line the gorge with amazing rocky overhangs providing most welcomed shady spots. The Barranco leads us back to the caves, just in time for lunch at the caves’ restaurant overlooking the botanical gardens and the coast. After lunch it was a short trip to centre of Nerja to visit the town. Firstly we stopped at Nerja’s famous viewpoint, the Balcon de Europa, named by King Alfonso XII in the 18th Century after he visited the area and was so impressed with the view. We then had a little time to dip our toes in the Med and enjoy a spot of window shopping before heading to our last stop in Nerja; the Nerja Museum. This gave us a real insight into the history of Nerja from the cave dwellers of the Palaeolithic times through to the present day. Late afternoon we headed back to Malaga and were excited to get to see more than just the airport. We checked into our new hotel, the 4 Star Molino Lario and freshened up before setting off to explore the city. The city centre is pedestrianized and well signed posted for the main sights like the Cathedral, the Picasso Museum and the Roman Theatre. The Alcazaba, built on the ruins of a Roman fortification, is a maze of narrow streets originally designed to slow attacking forces from entering the stronghold. Water plays a big part of the design, with rivulets, water features and fountains aplenty. As you make your way up to the landmark, views open out to the harbour and city rooftops. 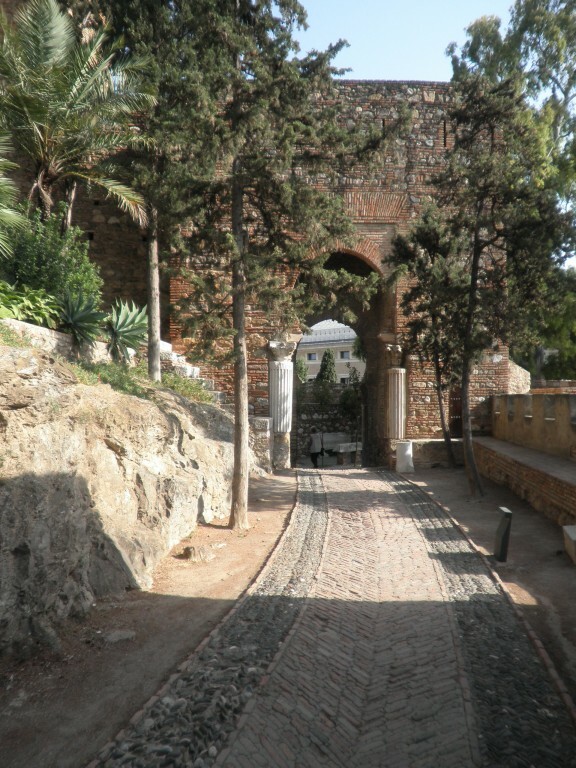 After our visit to the Alcazaba we wandered around the pedestrianized area and found a small tapas bar for dinner. There was a wide choice with delicacies like almond soup, empanadas, fried aubergines, morcilla and octopus in smoked paprika, all paired with the local wine. Our very long day ended on the rooftop of the hotel at the pool bar for one last drink before heading to bed for a well-deserved rest. It was certainly nicer to start the day at a later time today and with a relaxed breakfast in the hotel courtyard. We enjoyed a delicious hot and cold buffet with an espresso to give me my morning jolt. Our first stop was at the food market to admire the intricately laid out stalls of seafood, fruit and vegetables. Our next stop was the Gibralfaro Castle perched atop the highest point in central Malaga. Dating from the 10th Century, you can walk all the way around the castle and even look down into the bullring. We spent a little time looking at the small museum just inside the entrance and then it was off to the Finca el Cerrillo for lunch. The afternoon we set off on another walk. We set off along a track before dropping down into woodland filled with a variety of wild flowers and reaching Salares by crossing the Puente Arabo (also known as the Puente Romano). We then walked through the village to Theo’s bar for a cool drink served with plates of fruit and fresh apricots picked off the tree. The early evening gave us a chance for a dip in the pool before Sylvia picked up to take us to dinner at the Cortijo Paco restaurant in Competa. We feasted on Gambas pil pil, mixed local cheese, pork solomio, chicken with leeks and some delicious local desserts. After a good night’s sleep we filled up on the breakfast buffet and Gordon gave us tour of the hotel rooms and grounds. Each of the 13 rooms are unique, my personal favourite is garden room four with its private roof terrace. There are several shaded seating areas dotted around the grounds, and a secluded tree house with honesty bar, perfect for getting away from it all. We set out mid morning to Sedella and made our way up past the Roman terraces still in use today. We stopped at the old mill, a vital part of the resistance to Franco’s regime and then ascended a ridge for views stretching out over the valley. Vultures are often seen here as there is a sanctuary nearby, a reminder of this is in the statue found at the picnic area. The path descends from here back into Sedella. We made it back to the Finca for a late lunch and met up with our lovely new Headwater arrivals, all of whom were returning guests. Dinner this evening was at the Finca with a variety of tapas, chicken in fresh herbs and lemon, all made by Christine and hosted by her husband David. The night ended with a drink on the terrace, making use of the honesty bar, where you are encouraged to pour yourself a ‘Spanish’ measure. 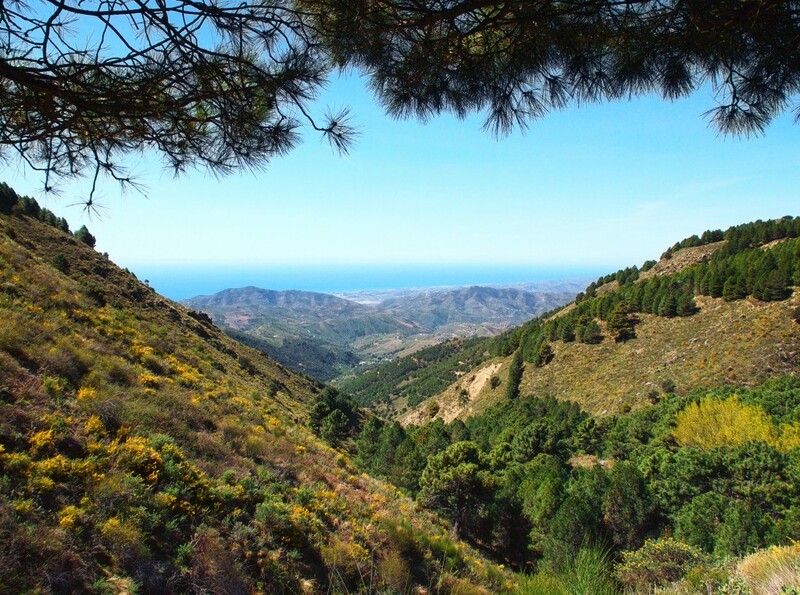 Today we set out on a walk to Competa along with our Headwater guests. Transport was arranged to take us from the Finca to the Hermita Santa Ana at the top of the village. We made our way along the high path to Competa passing small holdings and walking along the acequias to reach the Bodega Jafal. Wine production in the area has a long and interesting history and is very different to the way wine is produced in France or Italy. The family talked us through the process step by step from planting the vines through to sampling the finished product. Onwards and upwards to the centre of Competa for a lovely tapas lunch in the square. The return route took us along the lower path, passing flowering Agaves. We had some time in the afternoon to sit in a shady spot with Sybil the dog and Polly and Manuel the cats, taking in the wonderful scenery. The evening saw us in Canillas de Albaida at Gustavo’s restaurant in the main square. A jug of Sangria accompanied salad, prawns, salmon and steak followed by a fantastic crème catalan. A final stop at the honesty bar before an early night.